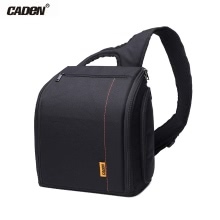 CADeN D8 camera sling bag for outdoor photography. 10mm thick sponge protects your valuable camera and lens away from scratches, dust and reduce impact. Stereo outer keeps a good shape. Sing design enable you to move the bag from back to front quickly. Splash-proof, wearable and stereo polyester outer, with waterproof rain cover. Bag capacity, can store 1 camera and 2 lens. Several pockets for iPad, smartphone, memory card, charging cable & etc, keep your item neatly. 10mm thick high resilience sponge inner protect your valuable devices away from scratches, dust and reduce impact. Thick shoulder strap reduce physical fatigue, length adjustable; sling design enable you to move the bag from back to front quickly. The protective bottom pad can reduce damage caused by unbalanced surface. Can be opened from side or front. The below cameras are just part of the compatible models, please measure the camera size and compare it to the bag&apos;s size. For Canon 50D 60D 100D 550D 600D 650D 1000D 5D 7D 350D 400D 450D 40D 5D Mark II 6D 70D 700D 750D 760D 1200D 5D Mark III & etc. For Nikon D60 D90 D3100 D3200 D5200 D7000 D7100 D70S D80 D300S D40X D600 D800 D5100 & etc. Item Size: 30.5 * 24.5 * 17.5cm / 12 * 9.6 * 6.9"
Package Size: 30.7 * 24.7 * 17.7cm / 12.1 * 9.7 * 7"